We are a team of chartered physiotherapists, committed to providing you with a high quality, professional, confidential & personalised service. At Alderbank Physiotherapy and Sports Injuries Clinic our physiotherapists are registered with the Health Professionals Council and Physio First. Our clinic is registered with all major health insurance companies. Patients may self refer or be referred by a doctor, consultant, solicitor, medico-legal companies, occupational health departments or other allied health care professionals. Detailed assessment, treatment & rehabilitation on an individual basis. 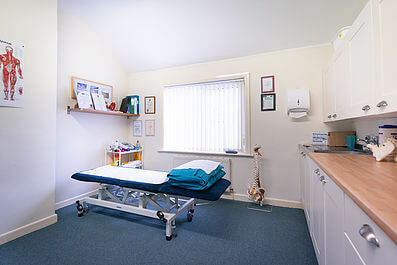 For Sports injuries, back & neck pain, headaches, joint pain, soft tissue injuries & pre and post operative rehabilitation. Facilities utililising the latest techniques & modern equipment to optimise your recovery. Simply put, physiotherapy encompasses a range of skills and techniques to speed up the recovery from injury and relieve aches and pains. A physiotherapist is trained to a high standard to assess and diagnose your condition and treat your problem so that you can reach your full potential and maintain an active lifestyle. We aim to restore normal movement using manipulation, massage and exercise with the help of pain relieving modalities such as electrotherapy and acupuncture. We always aim to find out why the problem has developed and advise on ways to minimise recurrence. We also rehabilitate patients with tailor made exercises to ensure they can continue or even improve their activity or chosen sport. In a recent customer satisfaction survey: 100% of patients reported the overall quality of care they received as excellent and also 100% of patients felt that the physiotherapy services at Alderbank Clinic provides ‘value for money’.